The historic weekend at Thunderbird Stadium in Vancouver BC saw the US Freedom take on the Canadian Eagles in what we think is a first for footy - a women's Australian Football international. The weekend actually saw two games between the squads with the Freedom easily taking both matches. Saturday's 2 x 20min game saw the Freedom win 7.7 (49) to 0.0 (0), while Sunday's 4x15min game saw the Freedom go 14.13 (97) to 0.0 (0). For one of the founders of US Women's footy, Kathryn Hogg, it was a great weekend. "It was a big milestone for US Women's footy and for all women's footy in North America. One thing that I am proud of is that with our small pool of players, we were able to get 23 women to commit to playing. Three of them were unable to make the trip due to injuries - Denielle David from Milwaukee, Pernille Christensen from Atlanta, and Karla Mascerena-Pack from Arizona". Story is now updated with interview with Canada's women's coach Jake Anson. The game was played during a weekend that saw 2,500 people come through the gates to watch two full days of footy games including two men's internationals, two junior internationals and the local clubs playing for the BC Footy Cup. The first game started as a desperate struggle but the intensity and desperation of the Freedom overwhelmed the Eagles and the Freedom ran out easy winners. Coach Wayne Kraska was elated. “I am blown away by this win. We had excellent handball running and the support for each other on the field was fantastic.” In the second game the US was once again dominent. They were able to move the ball out of the packs with more effectiveness than the Canadians and then use the open space. In front of goals the Freedom took every opportunity that was given with some excellent long kicks that bounced through for six points, and some wonderful snaps under pressure. Best for the Freedom were Tina Arend, Nicki Peoples, Erin Welsh, Judith Stein and Diana Pizzari. While the Canadians will be disappointed with the result, the team and their coach Jake Anson have made amazing strides in their first few months of existence. They had some injuries and absent star players and with a very young team it might not take them as long as their male counterparts to get their first win against the US in international footy. 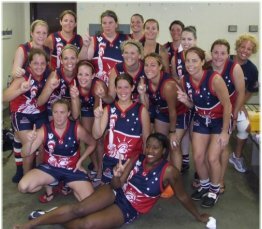 Women's footy in the US has come a long way since the 2003 USFooty Nationals in Kansas City which saw the first women's game. Kathryn Hogg is the only member of the Freedom that played in that game and she was very excited to represent her country. "From my perspective it was really fun playing with women that I haven't had the chance to play with regularly. Wayne had the weekend planned out really well and I appreciate that he used the weekend as a mini training camp as well. The team came together quite quickly and are looking forward to our next opportunity to train or play together." The 2007 season has seen a number of women's games, including a big win for Kraska's Atlanta against Milwaukee. Canada's coach, Jake Anson, while obviously disappointed to not get on the scoreboard, was full of praise for his young squad. "Though the scorelines may have looked one-sided on paper, our girls played very well and but for a couple of good defensive marks in the goal square, they would have put a couple of goals up on the board". With six players under the age of 16, and many of the older players only taking up the sport since May this year, the future is certainly a lot brighter than the results suggested. He had particular praise for Marlena Ginocchio (15) and Kourtenay Brooks, both products of the North Delta Junior AFL in Vancouver. Liz Spruin was best for the Eagles and Anson said winger Leslie Gurba "runs like the wind and tackles hard", and he was very impressed with his captain, Melburnian Claire Brown, one of two Aussies the team fielded (the other not having played footy prior to arriving in Canada). Anson is very positive about the future of the game in Canada's west. "Off-field, the Calgary Kookaburras are going great guns, and we're starting a second training squad in Vancouver to accommodate their junior girls and our girls moving there in the coming months. We have girls relocating back to Ontario and Nova Scotia for uni, so we're sending footies with them and hope to get small training units in each of those locations so the girls will be in good shape when they meet up to play with us at the US Nationals. We're chasing sponsors to pay for kit and travel etc, but have generally hit the ground running". Milwaukee, Atlanta, Arizona and the Canadian Eagles are planning to attend the USFooty Nationals in Louisville KY on October 13/14. So we look forward to some more exciting North American women's footy. Thanks to USFooty's Paul O'Keeffe for his contribution to this article. See also womensfooty.com, and the Vancouver Cougars website which fittingly pays tribute to the many people that made the weekend the success it clearly was. A great post Chris , seeing how it is Women's Week in the AFL . Last night in Sydney where Sydney was host to StKilda there were something like 10,000 plus women and men , there from around Australia supporting each other , to help in the awareness of breast cancer , a fantastic night and a tough hard win by the Swan's . Yesterday at the G they had a Women's Game on and the skill's were fantastic with some great running play . It was a pleasure to watch . Good to hear that women in the States and Cannada have embraced Australian Football and i hope it get's bigger and better .